The festive shopping season got into full swing last week, with the Black Friday sales, followed by a burst of internet shopping on Cyber Monday. To balance the bargain hunting, Present Aid is supporting Giving Tuesday today. This is the annual international day of giving, celebrating the good work people like you do to help others in need. At Present Aid, we offer you gifts with a difference for your family, friends or office Secret Santa. The gifts you buy will bring vital help to people in need around the world. Our quirky presents are guaranteed to raise a smile! If you haven't started your Christmas shopping yet, or are looking for a stocking filler, check the list below and visit the Present Aid shop. It's Giving Tuesday. 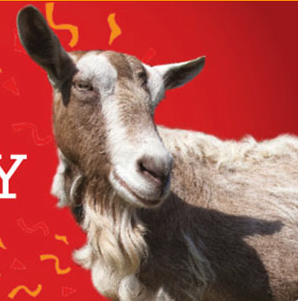 Our ever-popular gift of a goat could provide a family with the means to start a business and help transform their lives. Many families can't afford to send their children to school. You could give them the textbooks, stationery and essentials they need to study. Help a farmer in Mali build a granary today, and they'll be able to store crops properly to sell at market, allowing their family to plan for the future. You could help provide some of the most vulnerable refugees with footwear to protect them during the cold, wet winter months. Hygiene kits – including soap, toothpaste, toothbrushes, nappies and women's sanitary products – are essentials that can bring a sense of normality. This Christmas, your gift could help provide a survivor of sexual violence with a safe place to rest and the means to rebuild their life.